Remove your platinum jewelry when undertaking heavy work. It is also advisable not to handle bleach or harsh chemicals when wearing your jewellery. 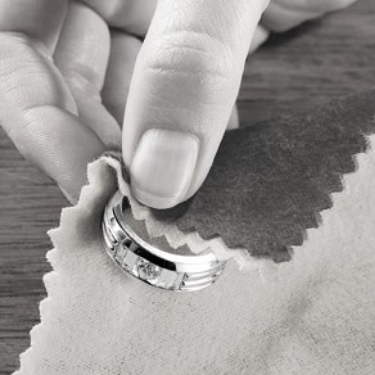 Although they won’t hurt the platinum, chemicals may discolor diamonds or gemstones. How will my platinum ring look years from now? All precious metals age with daily wear. Over time, platinum develops a rich finish, called a patina, but it doesn’t wear away. Many people prefer the patina look, but you can have your platinum jewellery polished if you would rather maintain a high shine. Look for a qualified jeweller or platinum-trained bench worker for all adjustments, resizing, polishing and cleaning.